As I am writing this, Wool Week 2013 draws to a close. It’s been a wonderful week full of inspiration, shared creativity and fun. I tried to go to as many events and workshops as time would allow. On schedule for thursday was the Rowan Yarns workshop at John Lewis Oxford Street. The classes were all booked out, so I decided to just drop into one of their open sessions, which also allowed me to check out the progress of the wool window. By Thursday, things were looking rather different. A majority of the originally white interior is now covered in colourful stitches.. they don’t even stop at the afternoon tea. Those who still think knitting is for old ladies only, think again. Knitting is the new Rock ‘n’ Roll. After saying Hi to the busy people in the window, I headed up the First Floor for the Rowan workshop. Upon arriving I noticed models of the snoods they were teaching to people – 3 different variations, all knit in wonderfully soft and chunky Big Wool. I borrowed a pair of needles, and one of the design consultants who work at John Lewis attempted to teach me to knit English Style (I’m normally a continental knitter). I started working on this cabled cowl and will definitely be making a few of these as Christmas presents. 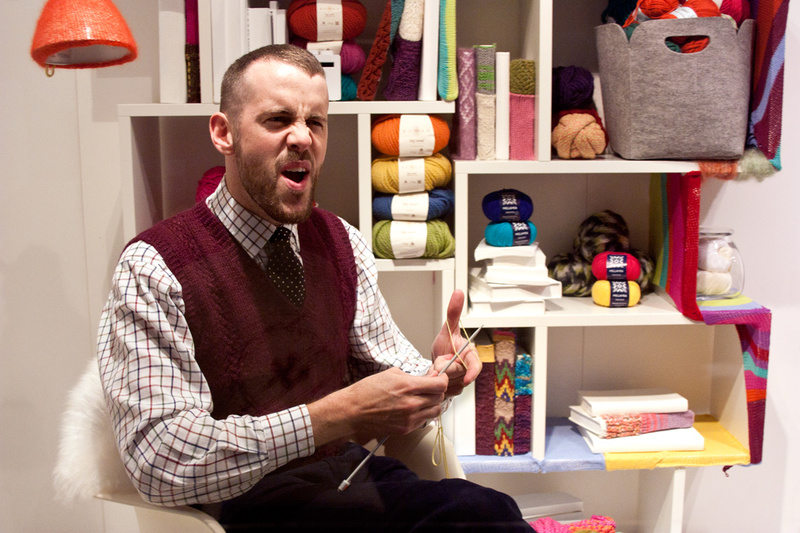 Stuart Hillard from the Great British Sewing Bee having fun knitting a purple scarf. After a good two hours during which I more or less successfully attempted fair isle knitting with one colour in each hand, it was time for another class. This one was fully booked, and even reality TV star Oliver Proudlock joined the group to learn how to knit. Since the pop-up store was getting really crowded, I packed what I had made into my already too-full bag and headed over to Liberty’s, where the Awards ceremony for the winner of Wool Week 2013 Hand Knit & Crochet Award was taking place. The Awards are a collaboration between Rowan Yarns, The Campaign for Wool, Liberty’s and The Royal College of Arts. To learn more about the awards, head over to the Campaign for Wool’s website. I got a chance to talk to the winners and Rowan brand manager Kate Buller and designer Marie Wallin, who are both very passionate about the competition, and who knows – they might even be recruiting some of those fresh talents to work with on future collections. Marie Wallin (wearing her own design Anatolia from Rowan Mag 54) then presented the awards and prizes to the winners and told the audience a little more about the designs and the creative minds behind them. Fab write up Anja. Love all of your photos! 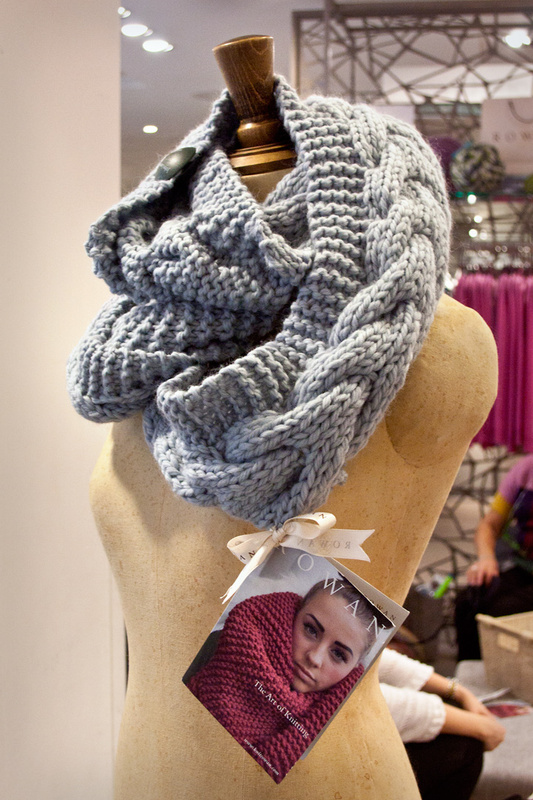 The Big Wool Cowl looks really gorgeous – must make one! The weeks events looked great – maybe I’ll make it to Wool Week 2014! This is a great blog post Anja, thanks for coming along to the RCA/Liberty prize giving. It was a real pleasure to meet you. Best wishes, Marie.